You can now match your nails to your Louboutins. 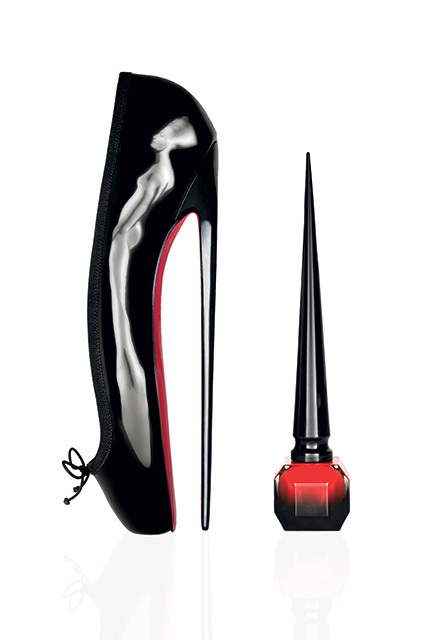 The signature red that adorns the soles of Christian Louboutin shoes is now a nail polish. Introducing Rouge Louboutin: a classic red nail enamel that mirrors the trademark color on the soles of the designer’s coveted shoes. Though it might seem a bit odd that Louboutin is reaching from shoes to beauty with Christian Louboutin Beauté, nail polish is in fact the root of the designer’s success. It goes back to 1992, when Louboutin was an up-and-coming shoe designer working on his third footwear collection. He noticed something was missing on a design sketch, and infamously took a jar of red nail varnish and painted the sole red. Rouge Louboutin is encased within an eye-catching crystal-faceted bottle with a spiky wand that is the exact heel height of Louboutin’s ballerina shoe. The $50 polish is currently available at Saks Fifth Avenue in New York and all 15 U.S. Louboutin boutiques, where it is artfully displayed next to Louboutin footwear. The Rouge polish will also be available at retailers like Neiman Marcus, Bergdorf Goodman, Nordstrom, select Sephora stores and the rest of the Saks doors starting Aug. 6. On Aug. 31, the brand will release the remainder of the 30 polish shades, which have been divided into three color collections: The Pops, which features bright pastels and vibrant hues; The Noirs of dark and rich colors; and Nudes, which offers a wide range of hues to complement any skin tone. For more information, visit christianlouboutin.com.